This article is meant to be an extension to the Camera Resolution Explained article that I published back in February of 2015. With the release of high-megapixel cameras such as the Canon 5DS / 5DS R and the Sony A7R II, more and more photographers are getting interested in these tools. They want to understand the advantages and disadvantages that such high resolution cameras bring and what changes they can anticipate to their workflows. In this article, I want to address these concerns and talk about pros and cons of low versus high resolution cameras. Please keep in mind that the term “low resolution” refers to the least resolution we see in modern full-frame cameras. Just a few years back, what I refer to as “low” in this article was considered state of the art. Hence, such terms are relative to the highest resolution sensor available today. When looking at cameras today, we see a number of different options, with camera’s ranging from 12 megapixels to a whopping 50. Why would one choose 12 MP and why would one choose 50 MP? What are some of the concerns and issues one needs to understand and take into account? Let’s analyze these in more detail. Lower resolution comes with a few advantages, as well as disadvantages. First, it results in smaller files, which are easier and faster to post-process. You can continue to rely on older computer hardware and even some of the lightweight “ultrabooks” can handle such files with ease. Second, smaller files also reduce the overall need for storage – you can use smaller capacity memory cards and smaller backup storage (whether local or online). Third, lower resolution images typically do not need to be resized / down-sampled – they look pretty clean “as is”, so if you need to quickly process and provide them to someone, you can do it with ease. Fourth, smaller files also make it possible for cameras to push higher frame rates, allowing them to be used for such needs as sports and wildlife photography, where fast frame needs are often needed to capture the right moment. Smaller files also put less strain on the camera buffer, allowing more images to be captured continuously at high frame rates. Lastly, lower resolution cameras are more forgiving on focusing errors and lens resolution – slight focus errors will rarely be noticed in images and if a lens is not capable of resolving a lot of detail, you will not see it in images anyway. Hence, for photographers who work with clients that do not require high resolution images, cameras with large pixels (and hence lower resolution) are quite advantageous. What about disadvantages? Lower resolution cameras translate to lower image dimensions in pixels, which means that you do not have a lot of pixels to start with. So if you need to crop an image heavily, you are basically out of luck – your will lose a lot of resolution and your images will become much smaller when doing so. This obviously limits further opportunities for resizing / down-sampling (see more on down-sampling below) and limits your output size, i.e. how big you can display images on a screen or in print. While there is software out there that can up-sample images, as we’ve talked about here, one cannot create more details when they simply do not exist. Sports and Wildlife Photography: need high frames per second (fps) for capturing fast action. Fast frame rates are generally preferred over higher resolution. Wedding Photography: clients rarely ever put high resolution as a requirement, and faster workflow for post-processing is preferred for quicker delivery. Also, weddings are typically shot hand-held and lower-resolution cameras are more forgiving for hand-held shooting. Documentary, Travel and Street Photography: resolution rarely matters for documentary, travel and street photography. Smaller files are easier and faster to handle. So what type of photography would require high resolution cameras then? Let’s talk about the pros and cons of high resolution cameras next. The biggest advantage of a high resolution camera and why people choose them is larger output size – when you want to make a huge print, or display all the intricate details of an image on a high resolution TV / monitor or on the web. With 4K TV screens (equivalent to 8.3 MP) and monitors already hitting mainstream and with 8K devices on the horizon (equivalent to 33.2 MP), we can see that the future technology is clearly in favor of higher resolution cameras. When stores showcase 4K TV screens today, they load special footage that was captured with high-resolution cameras to showcase the intricate details that a 4K TV screen is capable of displaying. So high resolution cameras automatically imply higher amount of details in images and video footage. The next advantage is “down-sampling”, a resizing technique sometimes also known as “resampling”, which basically uses software algorithms to reduce pixel dimensions. Down-sampling has a lot of advantages, because it effectively reduces noise in images and hides those slight focusing errors I’ve mentioned earlier. In essence, this means that high-resolution cameras do not necessarily mean more noise in images (in fact, in good light, you will find little difference in noise performance between low and high resolution sensors). But when dealing with low-light situations, when an image is reduced to the same print / output size, noise is also subsequently reduced. Another advantage of high resolution cameras is cropping options. Since you start off with a lot of pixels, you could crop images (sometimes aggressively) and still end up with plenty of resolution for high-quality print / output. However, high resolution cameras have their own list of disadvantages, some of which can be painful and expensive to deal with. 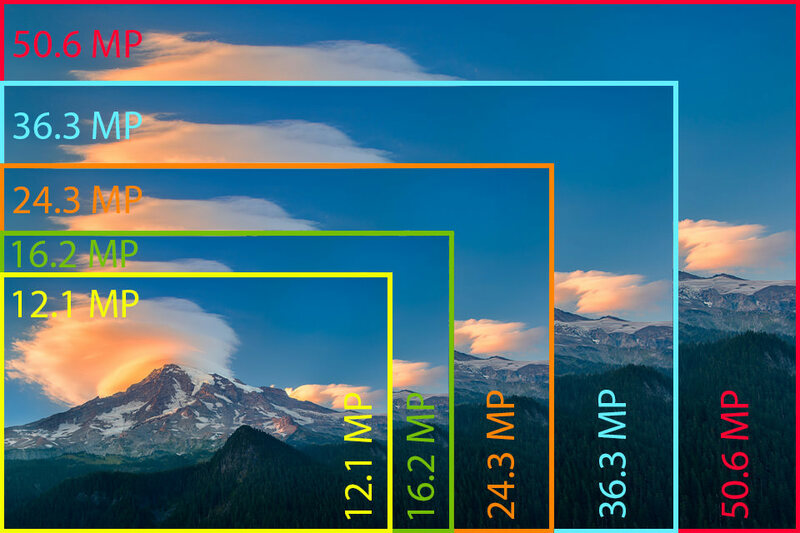 First, the higher the camera resolution, the bigger the image dimensions in pixels and hence overall file size. This not only puts a strain on storage, requiring larger memory cards, hard drives and backup storage, but also on processing power – you will need a computer that can actually handle such large files at acceptable speeds. Second, it effectively restricts camera’s frame rates and its buffer, because there is only so much bandwidth and data that the image processor can handle at a time. Third, high resolution cameras require high-quality lenses capable of resolving a lot of detail. If you own older lenses, you might find them to be inadequate, particularly when it comes to yielding good details in the corners. Fourth, if you want to be able to get superb pixel-level details when looking at images at 100% zoom, you will need to pay much more attention to your focusing techniques – even a slight focus error will show. And lastly, you will need to pay more attention to camera shake and potentially go beyond the reciprocal rule recommended norms. As a result, you might find yourself using a tripod more often than you would like. Landscape Photography: since the usual output is print and larger prints with more details are desired, high-resolution cameras are generally preferred for landscape photography. Architecture Photography: the same goes for architecture photography, where output size and details are important. Macro Photography: since macro photography is typically done in controlled environments using special lighting techniques, with camera gear mounted on a tripod, frame rates are not important and higher resolution cameras can be advantageous for tight cropping and printing needs. Studio Photography: also typically done in a controlled environment, with the goal of yielding high-quality prints, so high-resolution is typically preferred. I suggest that you take all of the above advantages and disadvantages into account before deciding what camera to purchase for your needs. Hope you enjoyed the article – please let me know if you have any questions in the comments section below! Sam, 24 MP is plenty for most needs, I agree! The image headlining this page/link is very visually misleading. The size of the sensor is not different from a 5D III to a 5Ds the amount of image collected itself would’t change, just the density of the pixels in that particular sensor. The image makes it seem comparable to looking at the differences between a micro 4/3, aps-c, full frame and medium format. Nasim, I think this is what Logan is referring to. This was brought up by an other reader in your first article. In fact, the illustration above is the one you correctly replaced in your first article (see comment by Jim Morey). Darn it, I was in a rush and did not pay attention which image I inserted from the media library. You are right – I used the wrong image. Thanks for letting me know – I went ahead and replaced it with the correct one! And my sincere apologies to Logan for misunderstanding his comment. Your use of the expression “image dimensions” deserves criticism. You hopefully know what you mean but you are using an undefined expression that causes confusion. Bengt, if you fire up Photoshop and open up the Image Size window, you will see that image dimensions refers to image dimensions in pixels – that’s exactly what I mean by the same words. I don’t see how “image dimensions” is undefined – I have been using it for years and it has not changed its meaning. Your readers are obviously unclear as to what you mean. If you mean pixel content, why not say so? Bengt, there was a misunderstanding between Logan and me regarding the image that I posted last night in error – please see the communication below. In digital photography, “image dimensions” always refers to pixel content. But if you feel that it needs to be clarified in the article, I would be happy to add a note. The expression “image dimensions” DOES NOT always mean pixel content. Image dimensions can be taken to mean several different things. Say exactly what you mean, without assuming that your take on it is prevailing ! Bengt, could you please clarify what else “image dimensions” can refer to in digital photography? I have been using this term for years and every piece of software that I have used also used the same meaning. I wrote scripts that resize images for the web and all programmers that were involved in the project also referred to this term the same way, meaning image dimensions in pixels. If there is different use for these words, please clarify and provide sources, so that I can learn. And I never said that my take is prevailing – if I am wrong, I will gladly apologize and correct the article. I did, but you are censoring it. I was not censoring, our anti-spam system automatically puts comments with links to moderation. I approved your comment earlier today. You will find “Width” expressed in pixels and “Height” expressed in pixels. NOWHERE will you find your expression “Image dimensions”. The expression is “Image size”. Size is a relative expression and does not become quantifiable until, in this case, you specify the dimension of one pixel. Dimension implies a defined and quantified measurement which is not applicable in this case. To each his own. I deal with 16MP and that is enough for what I wan’t to do with my pics. Yes when I do need ALL of those MPs I will pay extra attention to framing and composition but mostly even with 16MP there is enough for me to crop and still have enough resolution. Elvir, 16 MP is plenty for most people’s needs, as highlighted in John Sherman’s excellent article. High resolution has its uses for specific needs such as landscape photography. But for everything else, 16 MP is plenty enough, at least for now. When 8K TVs and monitors hit the market, then it will be another story – but that’s at least 5 years from now. At the rate of adoption 4k may only be starting to hit mainstream in 5 years. People spent a lot of money updating their TVs to HD but historically people don’t update their TVs like they do computers. They’re more like appliances. 3D couldn’t get any traction either. And there is the bandwidth issue. 1080 is already highly compressed now for mainstream use. There aren’t enough people (speaking US only here at the moment) who have fast enough access to get 4K at all, let alone with very high compression rates. Jacek, those Art series lenses have plenty of resolution for the D810, you can trust me on that. Great investment! I love my D750 too, but when I purely go for landscapes, it is hard to match the D810. Can’t wait to see how Nikon will respond to the 5DS / 5DS R and Sony’s new A7R II. Jacek, 50 MP has its uses for landscape photography too. But with Canon doing nothing on the dynamic range side, it is not an intriguing choice for me personally. I am much more interested in the A7R II – that camera is a game changer! The D810 is one of the best DR camera’s on the market. I don’t think DR is an issue, low light is currently, but tech always improves. Computers are only getting faster, buffers are only getting larger. You probably new to photography, the DR of larger sensors should be wider, the problem of this sensors you talked about is the technology used, with CMOS and Sony expertise the new 50MPx “medium format” can achieve the 14 Stops and mantaining the quality even in higher ISOs. The other sensors were CCDs, for many years they were know by the color accuracy and color gradation, more natural. Other than that Those sensors have very good dynamic range too, but not as good as the Sonys. Well they are not ccds? Please tell me what they are, because im very sure the first cmos medium format is the sony one with 50mpx. About DR, and smaller pixel size all i can say is this is not true, DR has been getting better with smaller pixels, At least with sony sensors, what kind of magic they do, i don’t know but has nothing to do with gattering more light. D810 has almost 15 EV with usable 6400 ISO? WOW you are completely wrong in your assumptions, sorry if you not believe me someone here can show atest for me. And i will dare to say these sensors you mentioned the 80 mpx one is a CCD sensor. CCD sensors are know for not being good in HIgh ISOs. show me your incredible photos Sir, maybe you can teach me something, funny that never someone have gone this far to take one of my photos bring to a site to critize it at take it personal, but yeah ok.
One thing 15 EV with iso 64 but at 6400 not even near it. The way you typed made me understand it wrong. I care because you said that it wasnt. And made clear -they are not CCD’s- like trying to make me feel ignorant a kid about a fact that im not. I’m very enthusiastic about image quality, because i really like to look at BIG photo and discover every nuance and texture of it. D810 doesnt give me that quality and no software will because its easy to spot in a big photo any type of manipulation. btw – a side note – you do realize that by very nature CCD’s are more light sensitive than cmos sensors, right? Its possible, but im not sure, i know that highligh recovery on CCDs are generaly better than cmos. CCDs got stuck in evolution terms, while CMOS advanced, im prone to say that your statement once was true, today probably not. it still is true – that’s why studio photographers have been using Phase One and Mamiya for ever. I know CCDs had less noise at lower ISOs, they can generaly go lower than CMOS, ISO 50 was the base ISO in MF for sometime ago, i guess it can go lower, but as i said some people talk about the CCD colors, phaseone said it was solved with this new MF cmos. For real, studio photographers still use CCD today because they have no competitorin size, as CMOS MF is not TRUE MF is a croped MF, and for the best quality and grain the CCD is still the king with 80mpx and Full size MF, i guess its cheaper too and studio photographers don’t need high ISOs, they work with the base ISO that will offer the best image quality. Its just a question of time. For me the CCD magic its mith nowadays. What do you mean “full medium format”? There are many sensor sizes and they are all considered medium format: 454 (D) 44 mm × 33 mm, 48 mm × 36 mm very common kodak format, Phase One uses 53.9 mm × 40.4 mm (it is Dalsa sensor I think – I know the older ones ware), Leica’s 45 mm × 30 mm…. so, what is the Full MF? 56 x 41.5 fuji Velvia i guess. I found a famous 60 x 60 that was the hasselblad standard, wich was the most used. So i will call it a Full MF. Yeah i totaly missed. I though it had clear standard in MF the 645 or the 6×6. But i supose that 645 is the nearest standard to the Phase one size sensor, wich i wanted to call FULL MF, but then i saw larger sizes and got confused, so using the 50MP CMOS one on the Phase One IQ2? body work as a cropped MF sensor. This doesnt really matter the tech becames newer as it evolves, but good to know you know it Sir. Correcting the IQ3 is not Full MF but its still bigger then the sony cmos one. Sir, many hardware advancements have been made, i know that there are other companys that produces good sensors, the sony at the moment is the best or at least the most known, i know that nikon possibly designed the sensors and sony learned from that, it just not take their merit. I feel sorry for someone trying to show knowledge, and trying to humiliate me pointing failures in my photos, on an open site, but Sir i hope your critic was legit, because everyone here will see what you are trying to do, its just bad for you. You the one who should be showing maturity to me. In the end i discovered that you are new to technology more than photography, but you gone as far as searching for my photos to make joke from them. And really not a legit critic: “here – if you happen to take semi good pic at least spend some time processing it (instead of leaving nasty mud of a noise and bokeh)”. I learn everyday with older and younger people and i accept that they probably know more about somethings than i will ever know, not all of them express in the perfect way. Thats why i only got angry when i saw very clear intention to hurt me. Well, my real sincere apologies to you, when i said that i really wasnt thinking bad of you i just wrote what came to my mind. English is a second language that im still learning and maybe this actually had a bit of interference. Perhaps the problem is fabricating a deeper ‘well’ to increase the DR? Not knowing much about sensor fabrication, I guess the substrate is ‘doped’ to form the sensels and that there’s a limitation as to what depth doping can take place to form a deeper well? To add to my comment above, there’s an excellent article on ClarkVision about sensor DR and how it’s affected by sensor size and other parameters. For landscapes i’dont really know with getting a 200 mpx sensor will ever bring the details of a Medium Format Film camera to a full frame sensor, I ve seen many d810 pictures even then, the grass and the foliage of the trees are never satisfying, always have some kind of mushyness, lacks colors too, The greens and yellows, the gradation are never true to life. This primarily affects when there are subtle tonalities of greens and yellows very near each other. The sharpest large prints I’ve ever seen were produced via drum scans of large format film. They looked tack sharp and palpable even with my nose almost touching the print. Of course the file sizes were enormous (much greater than 200MB), and my old MBP would probably burn up trying to process them. nah – this days software can handle this quite well – medium format has its limitations as well… Plus you can get pretty nice Mercedes to hold all the equipment you could buy (we are talking D810, few killer lenses and more) for the cost of one Mamiya Leaf 80MP digital back (not including lens, camera etc, etc. It will not happen. The colors the details nothing is like it, maybe the medium format 80 mpx get closer. Im still not impressed with actual cameras on this area. Very interesting article, but in the actual technology high def TV is only 2 megapixels I would like to see a comparison showing 3 identical pics shot at 12,24 and 36 megapixels in daylight all properly exposed of a landscape without any cropping, wouldn’t they all look practically alike on a 60 inch monitor even if the downsizing is helping the highest def image ? Luc, if the output medium is small enough, you will never be able to tell the difference. But once you put it on paper or on a medium that can display at high resolution, then you will see differences. Everyone talks about normal viewing distances for prints and output, but in reality, most people do come pretty close to a 4K screen to see the intricate details. The same thing with prints – a lot of people nowadays desire very high level of details in prints at very close viewing distances. In those situations, higher resolution cameras will bring out more details (provided that lenses and technique are good). You write that lower-resolution cameras are more forgiving when shooting hand-held. That is true when looking at 100%. But assuming the same output size it wouldn’t make a difference because the shake is also “resized”. So it’s not a reason anybody should choose a low-resolution camera for wedding photography (though there are other reasons as you named). Jano, yes, you are absolutely correct – when looking at the same output size, it would not make a difference. However, in reality, most people rarely ever compare images at the same output size and they want good pixel-level sharpness. In those situations, higher resolution sensors are more difficult to critically focus. I recommended low resolution cameras for weddings primarily because clients do not need more resolution and it improves workflow speed, which is important when working with thousands of files. You use the expression “lower image dimensions”. Dimensions are usually smaller or larger, not lower or higher. When you add the word “image” it is even less clear what you mean. The expression pixel is well understood and gives a good sense of the amount of detail information in a captured image. I use high resolution cameras for wildlife, including birds, because even the longest lens is usually too short, requiring heavy cropping to bring out the subject. With modern processing I would say that the only real disadvantage of a high resolution camera is a relative disadvantage in very low light. Otherwise you can do everything with a high resolution camera that you can do with low resolution, whereas the opposite is not true. Bengt, a number can be lower or higher. Image dimensions refers to image resolution in pixels. I am not talking about print size or any other dimensions. I am not using any new terms – you can Google “image dimensions” and see what the meaning is. Here is the first article that came up, which states: “Image dimensions are the length and width of a digital image. It is usually measured in pixels.” – what is unclear about that? I agree that higher resolution cameras can be useful for wildlife because of cropping. However, that also usually means getting lower fps, which means potentially losing important shots (particularly for fast action sequences, such as birds taking off). For stationary birds, it is not an issue. This is why wildlife photographers have been asking for a cropped sensor camera that can deliver high frame rates – because you get closer to action and you retain good fps. I like the simplicity of your articles. However, if you expressed yourself accurately and correctly when called for, you wouldn’t have to combat your readers and defend yourself afterwords. Bengt, please see my reply to your other comment. Logan’s misunderstanding was based on an image, which I posted in error (it has been replaced since). If you feel that my use of the words “image dimensions” must be clarified with reference to pixels, I would be happy to add a note. I was not aware that it was a confusing term, so I apologize if I made a wrong assumption. Your replies have been quite harsh and abrupt which maybe why Nasim has had to ‘combat’ his readers. I understood what Nasim meant by image dimension in his article. Although I understand the need of clarity over the use of phrases and concepts we can go too far in policing it. My comment was aimed at you and not at Nasim. The thing is, the vast majority of images are consumed web-size and very small (usually 1200px wide or smaller). And, honestly, the vast majority of pictures that enthusiasts (and certainly a number of pros) take are never even seen by people just stored on a computer. I think people overestimate their needs and go with big sounding numbers: just like with square footage of a house. It’s a way to show off. I think the first step to determining what resolution you need is to really look at what you’re doing with your images. Be honest about their use and display. Excellent comment NWCS and I fully agree. I totally agree as well. In fact, it would be better to state the disadvantages of each based on what the final output will be. I would agree too, but for one exception. A year ago I bought a 65″ 4K/UHD TV/Screen and put it on the wall and using it for digital “slides”. The total resolution is 8.3MP, the aspect ratio is 16:9. This is an entirely different proposition and a lot of pixels on a screen and not the usual web size we see here, a different ballgame. This is basically a large screen slide show with big wow factor. One has to shoot in landscape mode as it is not great for portrait mode, so artistically must keep that in mind when you shoot your images, and also that you loose a bit of the bottom and top of the image if you want to fill the entire 16:9 screen and use every on screen pixel available. This works out very well for me as I shoot 36MP (D810). Crop 16:9 in LR and for a full image width 7360 x 4140 pixels (unless more severe/real cropping is required). This is downsized and saved to exactly 3840 x 2160 pixels which is the native resolution of the 4K screen and very close to 4:1 ratio – that should help the algorithm as 2, 4, 8 etc are ideal ratios. Of course this is way superior to my old D700 12MP downsized to 8.3MP. It looks great on 65″ and with 4K/UHD screens of decent size and price are becoming available, I can see many more doing this in the future – perhaps even for those shooting weddings as an extra service. Just keep in mind to shoot landscape, portrait just does not work. Also, get the colours right requires a bit of work – for example, in my case, greens needed to be boosted and contrast lowered – well worth the effort and gotten plenty of ooh and aahs from visitors after dark. Imagine what we will do with VR technology, 1:1 ratio for every image, no more needs to print no need for big tvs, photography will change again. We will be able to revive that moment. How about APS-C? I mean 24MPx on APS-C is like 50-something on FX (when talking about pixel density and I believe this is what counts when talking about lens resolution and focusing problems) so how all those pros and cons apply to 24MPx APS-C? Bengt, showing me random images does nothing to prove that image dimensions have different meanings other than pixel dimensions. Either way, I have already updated the article with references to pixels. Can we just drop these arguments? If you have corrected the article, I am done. Thank you Bengt! Please understand that my intentions were not to show off or to prove my point. I have been using the words “image dimensions” for years (especially in programming and web design) and never thought that they could be confusing. Will be careful about how I use those going forward. I think a better alternative would be “pixel dimensions”. “Pixel dimension” usually refers to the physical size of one pixel on an image sensor. “Image size”, as used by Adobe in Photoshop etc, is a well established expression for the number of pixels that make up an image. 8K TVs…..here in my country (South America) we barely see 4K TVs…. And about monitors….you are almost god if you could afford a 4K one (1500+ dls). BTW….when you watch at a 65″ 4K TV you are not going to stand at 1ft away from the screen (unless you want to ruin eyes)….take in consideration on how far you stand to the screen/print. Photography is not a cheap job/hobby. Sooner or later you must up-grade your storage/memory cards/PC etc. I think that 36 MP will be a standard resolution for 35mm DSRL. And if you have a Nikon D810 you can use it with a lower resolution. If you have a low resolution DSRL you can’t add more resolution. It’s just only a matter of physics. I’m a year late to this conversation. Hopefully it is still being monitored. My layman’s understanding of pixel size is that the larger the individual pixel the more photons it can contain allowing for smoother tonal transitions and a lessening of clipping at the highlight end – or at least giving more of a shoulder to the characteristic curve than the abrupt clipping found in cameras of high pixel count on small sensors. Yet the newer the sensor the higher the pixel count and the smaller the individual pixels. How are the newer cameras overcoming what physics indicates should be an unavoidable, and increasing, clipping problem? While resolution improves with more pixels and somehow noise control is constantly being improved I don’t get why clipping isn’t getting worse. Excellent points have been made in your article. Technical discussions about image size in the comments not mean much to most. What is important is how your photos look in the way you use them. I am a landscape, nature and macro photographer, and often need to make large crops or large prints, so the 50MP Canon 5DSR is the perfect camera for me. To get photos approaching medium format cameras that are 10 times more expensive, was my hope, and I have not been disappointed. In fact, I almost never use my 20MP C 5DM2 or 7D anymore However, the highest quality photos are not achieved at minimal cost. I upgraded my laptop to the fastest high end Alienware gaming machine [fastest chips, highest ram, fastest graphic cards, etc] and got 3 x 5TB drives for double backup of LR storage of photos and catalogs kept on a Seagate external, so as not to immediately fill up the 1 TB of SS memory. I purchased 2 new * L* lenses and use a tripod if at all possible. Noise is not a greater problem, but one’s acceptance of noise becomes less when you shoot with higher resolution. I am not happy with a photo unless it is nice and clear at 1:1, and downsampling to deal with focus is not an option unless required by a website. Unless I desire a bokeh, I want the entire image in-focus: from 1 ft to infinity. So I learned focus stacking In PS and use it a ton, ’cause shooting at f/16-22 reduces the clarity of an image and an out of focus foreground or section of a macro, detract greatly from a sharp high-res image. The focusing of the 5DSR is much better than my two other camers mentioned and I only use manual focus for star or moon photography. To make sure noise is not noticeable and to do the best sharpening, I found that DeNoise from Topez is much better than LR or PS, getting the impossible result up to 6400 iso of less noise with better sharpening. But, shooting at a low iso is always the best choice for any camera. In summary, the 5DSR produces the most awesome photos I have ever taken, by far, and to go back to my 20 MP cameras is almost like having to watch in HD video format when you have gotten used to UHD 4K video. The difference is striking when one compares the resolution of the new vs the old cameras on a 24×36 professional print. I wonder if there are any differences in term of low light performance in between 24MP and 16MP sensor? Assumed that they are both ASP-C size sensor. Very nice article! You mention that with higher resolution cameras is needed a lens able to manage that amount of pixels (sorry if it is not the exact expression). Considering that, how can I know the maximum resolution that my lens can reproduce? My gear is Nikon D5500 + 18-55mm kit lens.